In the wake of strike, all educational institutions including schools, colleges and universities in Odisha will remain closed today, a statement issued by the State’s Higher Education Department said. Activists under the banner of Centre of Indian Trade Unions (CITU) block a train in Malda. Bharat Bandh LIVE Updates: The strike disrupted rail and road traffic in Odisha. 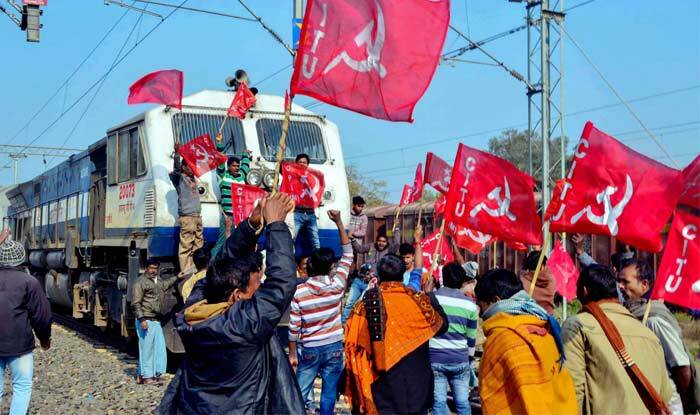 Train services were hit as trade union activists staged rail roko on the first day of the 48-hour strike at many places including Bhubaneswar, Cuttack, Puri, Balasore, Jaleswar, Bhadrak, Sambalpur, Berhampur and Paradip. Bharat bandh LIVE Updates: Sporadic incidents of vandalism and disruptions were reported from some parts of West Bengal since earlier in the day with the strike supporters blocking rail and road traffic. A number of senior Left leaders including CPI-M’s Sujan Chakraborty were detained while picketing at various places in Kolkata. Bharat bandh LIVE Updates: A woman, an angadwadi worker, collapsed and died at the protest site in North Karnataka’s Mundagod town, reported News 18. Bharat Bandh LIVE Updates: Over 32,000 employees of Mumbai’s civic transport undertaking went on an indefinite strike on Tuesday over various demands, including higher salaries, prompting the state government to invoke the Maharashtra Essential Services Maintenance Act (MESMA) against them. Bharat Bandh LIVE Updates: In Kerala, trains were stopped in Thiruvananthapuram, Tripunithura, Shoranur railway stations. Venad Express, which runs from the state capital to Shoranur Junction daily, was delayed by more than one hour as agitators squatted on tracks, blocking its route, and raised slogans. Other trains that were stopped here were Jan Shatabdi and Raptisagar Express. However, the Sabarimala pilgrims, tourists, social and religious functions have been exempted from the strike. New Delhi: Normal life is likely to be crippled across the country on Tuesday and Wednesday due to two-day nationwide strike called by central trade unions against the alleged repressive policies for workers adopted by the Narendra Modi-led BJP government. Ten trade unions who have jointly called for the nationwide strike are INTUC, AITUC, HMS, CITU, AIUTUC, AICCTU, UTUC, TUCC, LPF and SEWA. Following the strike, commuters in Bengaluru Delhi and Mumbai are likely to suffer as buses and autos will stay off roads. In Bengaluru, KSRTC, BMTC along with auto-rickshaws buses will not ply on both days. However, App-based cabs, airport taxis will function. Operators of Mumbai’s BEST buses have also threatened to join the nationwide protest. However, in West Bengal, Mamata Banerjee-led Trinamool Congress government has clearly stated that no strike will be allowed in the state on January 8 and 9. The state government has also asked employees to not take any casual leave. Tapan Sen, general secretary of CITU (Centre of Indian Trade Unions) asserted that bank and insurance employees, public and unorganised sector employees along with port and dock workers are expected to participate in the two-day protest called against economic crisis, price rise and acute unemployment. In rural areas, farmers across the country under the aegis of the Left peasant wings have threatened to observe ‘gramin hartal’, rail roko and road roko against the “failure” of Prime Minister Narendra Modi’s government to address rural distress.